1. I should like to die. Death anticipated. This is one of his earliest compositions, and is unworthy of the position it holds. 2. Through the valley of the shadow I must go. Death anticipated. 3. Whosoever heareth, shout, shout the sound. Jesus the Way. Written during the winter of 1869-70 after hearing Mr. H. Moorhouse (from England) preach on St. John iii. 16. 4. Almost persuaded now to believe. Procrastination. This was suggested by the following passage in a sermon by the Rev. Mr. Brundnge, Bliss being present at its delivery:—" He who is almost persuaded is almost saved, but to be almost saved is to be entirely lost." 5. Ho! my comrades! see the signal. Faithfulness. 6. O! Jerusalem, the golden city, bright, &c. Heaven. 7. On what Foundation do [did] you build? Christ the Foundation. iii. The Song Tree, 1872. 8. Light in the darkness, sailor, day is at hand. Safety. This hymn, “The Life-Boat," has attained to great popularity. The incident upon which it is based, that of the rescue of a ship's crew by a life-boat, is given in detail by Mr. Sankey in his Sacred Songs, &c, No. 99 (large ed.). It is sometimes known by its refrain, "Pull for the shore," &c.
9. In me ye may have peace. Peace. 10. To die is gain. Death anticipated. 11. Down life's dark vale we wander. Death anticipated. 12. More holiness give me. For Holiness. 13. Only an armour-bearer. Soldiers of the Cross. 14. Standing by a purpose true. Faithfulness. 15. This loving Saviour stands patiently. Invitation. 16. A long time I wandered. Peace and Joy. 17. Brightly beams our Father's mercy. Mercy. 18. Come, brethren, as we march along. Praise. 19. Free from the law, O happy condition. Redemption. 20. Have you on the Lord believed? Fullness of Grace. This hymn arose out of the following circumstances :—" A vast fortune was left in the hands of a minister for one of his poor parishioners. Fearing that it might be sqmandered if suddenly bestowed upon him, the wise minister sent him a little at a time, with a note saying, “This is thine; use it wisely; there is more to follow.” Hence also the refrain ‘More to follow,’ by which the hymn is known." 21. How much owest thou? Divine Claims. 22. I know not the hour when my Lord will come. Death anticipated. Suggested by reading the book, The Gates Ajar. 23. See the gentle Shepherd standing. The Good Shepherd. 24. Though the way be sometimes dreary. Divine Leading. 25. Will you meet me at the fountain? Fountain of Living Water. The incident out of which this hymn arose is thus stated in The Christian, No. 365, "At the Industrial Exposition at Chicago it was an everyday appointment to meet at the Central Fountain. Mr. P. P. Bliss, whose mind seemed always set on things above, caught up the words, and wrote this hymn, 'Meet me at the Fountain.'" vii. Gospel Hymns, No. 1, 1875. 26. One offer of salvation. The Name of Jesus. 27. Wandering afar from the dwellings of men. The Lepers. viii. The International Lesson Monthly, 1875. 28. Weary gleaner, whence comest thou? Duty. 29. The whole world was lost in the darkness of Sin. Light of the world. 30. Man of sorrows! what a name. Redemption. 31. The Spirit, O sinner, in mercy doth move. Holy Spirit. ix. Gospel Hymns, No. 2, 1876. 32. At the feet of Jesus. The good choice. 33. Come, sing the Gospel's joyful sound. Salvation. 34. Cut it down, cut it down. Justice and Mercy. 35. Do you see the Hebrew captive? Prayer. 36. Hallelujah, He is risen. Easier. Written in the spring of 1876 and first sung by Bliss on Easter afternoon, 1876, in the Court House Square, Augusta, Georgia, to 5900 people. 37. In Zion's rock abiding. Safety. 38. Repeat the story o'er and o'er. Grace and Peace. 39. Tenderly the Shepherd. The Good Shepherd. x. Gospel Hymns, No. 3, 1878. 40. Hear ye the glad good news from heaven. Faith and Salvation. 41. I will sing of my Redeemer. Praise. xi. Gospel Hymns, No. 4, 1881. 42. 'Tis known on earth and heaven too. More about Jesus. 44. March to the battle-field. Duty and Victory. 45. There is sin in the camp. Hinderances. 46. 'Tis the promise of God. Praise. 47. While the silvery moon-beams, fall, New Birth. 48. God is always near me. Omnipresence. Two hymns," I am so glad that our Father in heaven," and " Sowing the seed by the daylight [dawnlight] fair," (sometimes given as " Sowing our seed in the morning fair ") are usually attributed to Mr. Bliss. In his Gospel Songs, Cincinnati, 1874, however, he lays claim to the music only. Mr. Sankey attributes this last to "E. A. Oakey." With the exception of No. 48, these hymns are given in Mr. Sankey's Sacred Songs & Solos, Pts. i. and ii. Their popularity is far beyond their literary merits, and is mainly due to the simple melodies to which they are wedded. As a writer of hymns of this class Mr. Bliss is second only to Mrs. Van Alstyne. Many anecdotes concerning hymns of this class are given in American Evangelists; an Account of their work in England and America, by the Rev. Elias Nason, Boston, U.S., Lathrop & Co., 1877. Bliss, Philip , p. 151, i. "Sowing the seed by the daylight fair" is in the Family Treasury , Edinburgh, 1861, pt. i., p. 84. It is said to be by Miss Emily Sullivan Oakey; born at Albany, N. York, Oct. 8, 1829, died May 11, 1883. Note also that Bliss's hymn, No. 43. on p. 150, ii., should read, "Sing them over again to me." 1. Memoirs of Philip P. Bliss. Edited by D. W. Whittle. Contributions by Rev. E. P. Goodwin, Ira D. Sankey, and Geo. F. Root. Introduction by D. L. Moody. New York, &c.: A. S. Barnes & Co., 1877. 2. My Life and Sacred Songs. By Ira D. Sankey. With an Introduction by Theodore L. Cuyler, D.D). London: Hodder & Stoughton, and Morgan & Scott, 1906. “Do you see the Hebrew captive kneeling?" p. 294. "Down life's dark vale we wander." p. 285. "Ho! my comrades, see the signal." p. 105. "'Tis the promise of God full salvation to give." p. 99. 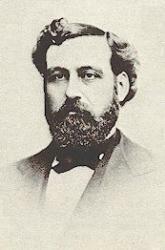 Philip Paul Bliss (9 July 1838 – 29 December 1876) was an American composer, conductor, writer of hymns and a bass-baritone Gospel singer. He wrote many well-known hymns, including Almost Persuaded; Hallelujah, What a Saviour! ; Let the Lower Lights Be Burning; Wonderful Words of Life and the tune for Horatio Spafford's It Is Well with My Soul. Bliss's house in Rome, Pennsylvania is now operated as the Philip P. Bliss Gospel Songwriters Museum.